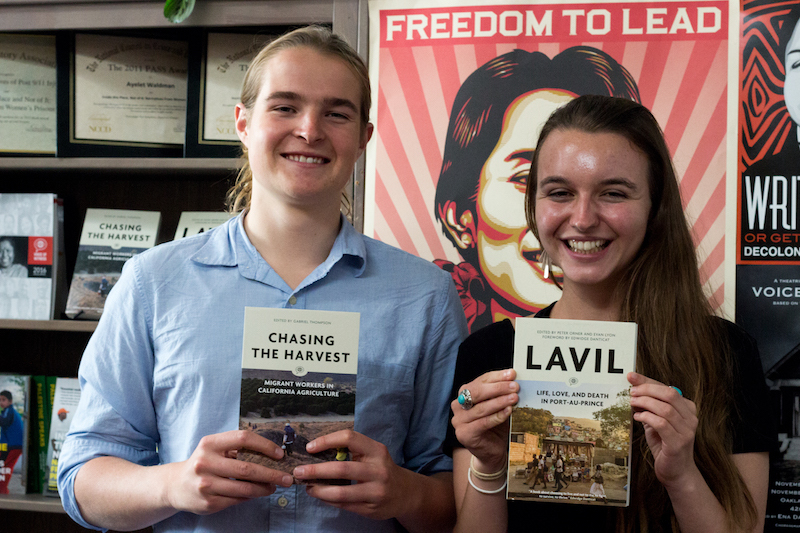 Two Haverford students are currently interning at Voice of Witness in San Francisco, Calif. this summer: (from left) Philip Reid '19 and Mary Kearney-Brown '19. Though the bulk of her work as an English major is focused on stories in books, for this summer at least, Mary Kearney-Brown ’19 will get to know the stories of people’s lives. With funding from the Center for Peace and Global Citizenship (CPGC), the Golden State local is getting valuable experience at San Francisco nonprofit Voice of Witness (VOW), which is dedicated to the amplification of unheard voices through oral narratives. One of VOW's primary tools is a self-titled book series documenting, via oral histories, the stories of people affected by injustice: the wrongfully convicted, undocumented immigrants, people living under oppressive regimes. By using first-hand accounts, the VOW books present realities of injustice that could otherwise be abstract. Naturally, interviews are critical to the book's success and the organization’s mission, so Kearney-Brown’s job includes transcribing and editing them and organizing timelines of the oral narratives. This summer Kearney-Brown has been moved by stories of a Palestinian athlete who “would go running because he liked the feeling of being free” and that of a Burmese sexual assault survivor who, despite an abusive husband and an oppressive regime, felt both happiness in teaching and love for her students. In addition to helping with the creation of the VOW books, Kearney-Brown is also contributing to the organization’s education program. It focuses on training writers, teachers, attorneys, and doctors in areas of human rights advocacy. For this, Kearney-Brown draws on older VOW publications to draft discussion questions for training sessions and workshops. Additionally, she has contributed to the VOW blog and assisted with the food-donations for training sessions hosted by the nonprofit. VOW's “intersection” of representation and advocacy is exemplary of the kind of nonprofit Kearney-Brown hopes to work with in the future. When she first discovered the internship through the CPGC, she already had experience both working at an educational nonprofit and in an editorial position at a magazine. VOW not only represented a great combination of those two jobs, it was also close to home. Currently, Kearney-Brown is living with a family friend outside the city, and commuting into the Mission District, where she enjoys feasting on fruit she buys from street stands. In the VOW offices she is joined by fellow Ford Phillip Reid, who is also an English major interning at the nonprofit thanks to CPGC funding this summer.